Blofeld stroking white fluffy cat? Check. Periscope built into the structure of the Russian Consulate? Erm, Check! 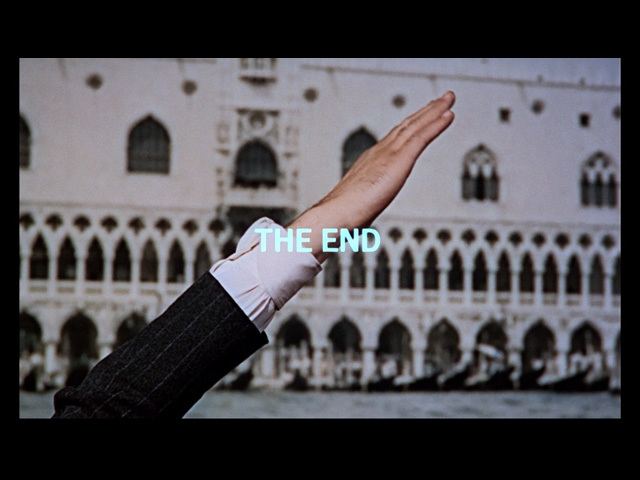 From Russia with Love, as the name may suggest, finds Bond very much cooking in a Cold-War, espionage stew. SPECTRE (more specifically Number 5: Kronsteen) devises a plan to get the British Secret Service to acquire a Lektor Decoder from the Russians, which they will then appropriate and sell back to the Russians. A plan is whisked up involving Russian cipher clerk Tatiana Romanova (Daniela Bianchi) who convinces the British that she wants to defect along with the Lektor Decoder. She is recruited by Rosa Kleb a SMERSH operative (unbeknownst to Tatiana, she is actually SPECTRE Number 2). Tatiana must butter up Bond, so that when assassin Donald Grant (also recruited by Kleb) kills Bond, she can return the Decoder to Kleb. Simples. From Russia with Love learns from Dr No and builds on it. Sean is as dapper as ever, and growing into his role as Britain's most eligible secret agent, armed this time with his trusty attaché case. Though throughout the movie I feel Bond is more led along the mission rather than the make-it-up-as-you-go-along plan of the first film. This is not important though as the intrigue of the plot is kept up as it twists and turns like a twisty turney thing (Blackadder). Right from the top we are wondering what's going on. Not only is there action before the opening titles (which goes on to be synonymous with 007 films) but it looks like James has come a cropper already! Of course this is just all training for the soon-to-be-hired-by-Rosa Kleb assassin, at which point we are treated to the titles accompanied by a woman shaking her tassels all over the place! The first scene following the credits could instantly be as anti-climactic as Subway bread as we knead our way into plot exposition territory. Fortunately, the mystique of Dr No's voice was remembered, but now we have the quintessential villain pulling the shots: the feline-fondling Ernst Stavro Blofeld. Though (if I'm remembering correctly) we aren't given a name, he's just known as Number 1. As Kleb and Kronsteen are lightly roasted, we realise that though they may have great criminal minds, it is crazy cat man who is really pulling the strings. The meat and potatoes of the film simmer between wonderful scenes such as the fight on the Orient Express where James and Donald Grant throw each other around a cramped booth, or the banter developing between M, Moneypenny and 007; and the slightly superfluous (though entertaining) visit to the gypsy camp, or the boat chase towards the end of the film. The boat chase gives an exciting climax to the escape, but I wan't sure who was chasing Bond (I was tired on Sunday night, but now I find it was Morzeny (Numberless SPECTRE agent?) who was trying to correct Grant's failure (Hoorah for the DK James Bond Encyclopedia - Oh Yes!)). Nice idea to have poisoned spiky shoes, but I couldn't help but think of Austin Powers: "Who throws a shoe? Honestly! You fight like a woman!" As a complete film I think I preferred Dr No, but I loved the Cold War feel of this, and the long journey on the Orient Express I thought was a great section, full of continental chic! I don't think 007 is the complete 3 course meal until the next film, but From Russia with Love gets him pretty damn close! Yeah, Well. The Dude Abides!